The Temple of the Tooth in Kandy, Sri Lanka. 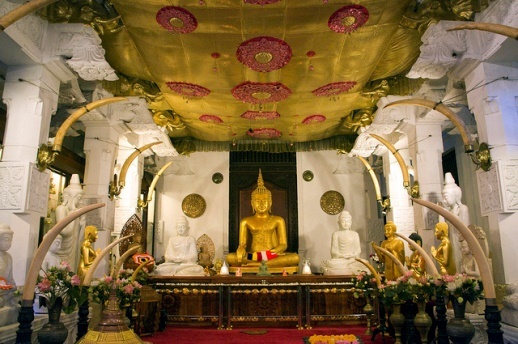 Over 70 per cent of Sri Lankans are Buddhists. Sri Lanka’s minority religious groups are concerned after Buddhist hardliners reacted angrily to the President’s proposed new constitution. President Maithripala Sirisena’s new constitution, proposed on 9 Jan., would decentralise power in a bid to prevent ethnic tensions in the country, but Buddhist hardliners say it contains provisions that regulate the power of the Buddhist clergy. The Justice and Buddha Sasana Minister, Wijeyasayadasa Rajapashe, denied this claim, saying they are intended only to enable the government to discipline monks who break the law. Others who oppose the change say that it is an attempt by the government to be more “likeable” to Western nations. Buddhism currently enjoys “the foremost place” in the Sri Lankan constitution. Article 9 decrees that “Sri Lanka shall give to Buddhism the foremost place and accordingly it shall be the duty of the State to protect and foster the Buddha Sasana [message]”. The constitutional change could be “good or bad news” for religious minorities, including Christians, who comprise around 7 per cent of the population, and Muslims, who account for 10 per cent, said Sheila Singh, a researcher for Open Doors, a global charity that serves Christians who live under pressure because of their faith. “It’s good news because it’s another milestone in the reformation that the Sirisena administration has been doing,” she told World Watch Monitor. “Last year, the Parliament successfully adopted the 19th amendment of the constitution, which devolved the many powers of Executive Presidency, which had been in force since 1978. The religious police unit established by the former President, which was used to further create tension between the Buddhists and the religious minorities, was also abolished last year. “Following these changes, we have seen a relatively improved situation for the religious minorities. But the caveat is that while the current government offers a more open and inclusive governance, Prime Minister Ranil Wickremesinghe dismissed the allegations that the foremost place given to Buddhism and the unitary nature of the country are being removed in the new constitution. 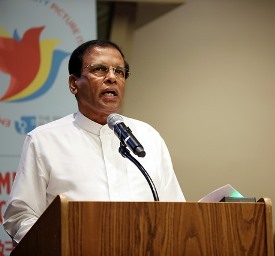 The Sri Lankan President, Maithripala Sirisena. “Nationalist parliamentarians and groups such as the Sinhale National Movement continue to guard the claimed identity of Sri Lanka at the expense of religious and ethnic minorities. The constitutional change may push through, but we are yet to see how this will really protect and integrate the religious minorities,” Singh said. Muslims are particularly concerned after a nationalist slogan was spray-painted onto the gates of Muslim homes in the Sri Lankan capital, Colombo. The constitutional change may push through, but we are yet to see how this will really protect and integrate the religious minorities. The slogan, “Sinha le”, which means lion’s blood (owing to the legendary origins of the Sinhalese people as emanating from the union between a human princess and a lion), was spray-painted on walls in other parts of the city, displayed on stickers and posters on vehicles and shared on social media. During the colonial period, foreigners in Sri Lanka were labelled “asinhala” (un-Sinhala); both Christians and Muslims suffered attacks. This nationalism has endured today through groups such as the Bodu Bala Sena, which wants a Sinhala-only nation. Cardinal Malcolm Ranjith, speaking at an event celebrating Sri Lanka’s oldest Catholic newspaper, Gnanartha Pradeepaya, on 11 Jan. said: “We must move away from the era when we thought of ourselves as Sinhala, Tamil or Muslim individually, or as Buddhist, Hindu, Islamic or Catholic. “What is required of us today is not to indulge in the hateful, racial and religious ideologies that can result in being imprisoned in the dark attitudes of the past. It is a need of the times to be bold enough to ban political parties and other extremists that base their manifestoes on racial and religious ideologies. It is our primary responsibility to protect the identity of the majority and at the same time to protect the identities of minorities,” Ranith said. Sri Lanka fell out of Open Doors International’s World Watch List in 2016, which ranks the top 50 countries where it is most difficult to live as a Christian. In 2015 it was at No. 44, while in 2014 it was No. 29. It remains on Open Doors’ list of Persecution Watch Countries.